This cloth basket has endless possibilities. Some ideas are to keep your sewing supplies in it like a sewing basket, fill it with books next to your bed or make one for your bathroom supplies. Change the material around for completely different looks, decorate it with embellishments or add prairie points. 2- 25" x 9" pieces of fabric, one for the outside and one for the lining. You can make these the same material or coordinating fabrics. Iron interfacing on circle, outer material, lining and handles. 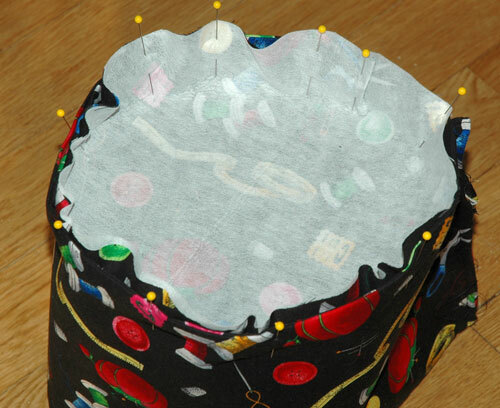 Sew outer material and lining with right sides together. Leave small opening on side edge to turn right sides out. Sew side edges together making sure to catch opening in seam. Pin circle to tube with right sides together. This is a little tricky see the picture below for help. 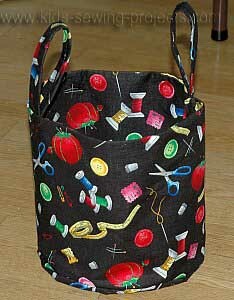 Sew along circle. Turn right sides out. To finish handles, turn edge in toward middle overlap with outer edge. Pin down middle. Zigzag down middle. Do the same for second handle. Pin handle to inside of basket. Sew in place. To make secure, stitch a square by sewing along one end of the handle turn the corner and sewing continue until you've created a square. To make this smaller basket cut your material 11 1/2" x 15 1/2" with a 10" circle. Follow the directions as above. 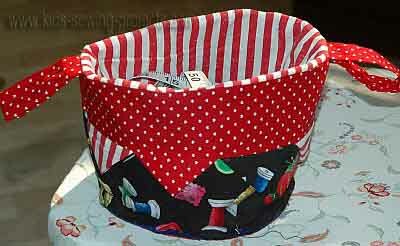 You can create a patchwork basket by making two strips, one 5 1/2" x 8"
and the second 6 1/2" x 8". (This would be similar to the project above. ) This will leave a sewing allowance so you can sew the two strips together and then follow the directions using the patchwork rectangle for the outside rectangle. Want to know how to add prairie points like the ones in the smaller basket?